Christmas season is the right time to deliver love and a message of hope to homeless and needy people. It’s time to think about little charity gifts that will make life of such people, especially children, a bit brighter. A number of charity organizations offer variety of projects you can choose from. To support their work, a good web presence would be a perfect idea. Free Responsive HTML5 Theme for Charity Organization is a fresh goodie produced by our designers and developers for you to start a site for non-profit organization. It can be any project that deals with charity. "Life in Color" – we named this template with an idea of bright future for all children and people who are in need. Let their life be better and happier. Your Free Responsive HTML5 Theme. How it Looks? 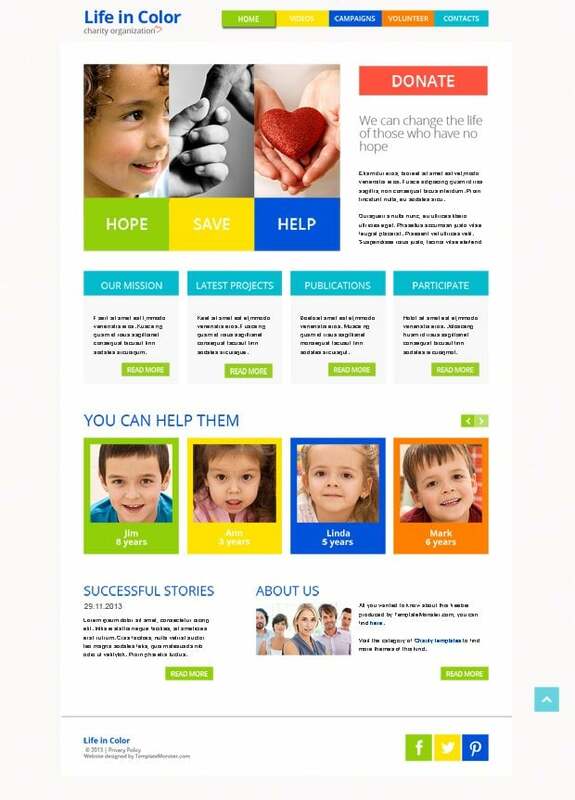 The key idea was to make this charity template look different from the common designs you can find around the web. It’s multicolored, bright and optimistic. Metro style (one of the major 2013 trends) was used to present this layout with a number of bright blocks that look pleasant on the eye, and are really effective. Such division of content using colors helps focus on the information the site communicates. You can integrate any video promoting the non-profit organization on the Videos page and engage people in various charity activities the company starts. Each page contains the “Donation” button placed in the top, so it’s always easy-to-reach for visitors. This visually rich design with optimistic tone is responsive, allowing viewers to browse it on handheld designs with various screen resolutions. Doing good is easy! Starting a site on the basis of free responsive HTML5 theme can be your gift for charity this Christmas. Looking at the Home page, you will clearly see that this design uses a contemporary approach (Metro style) to create an effective and content wise layout. ***Embedded video on Videos page will show your site visitors the latest promos of the charity organization the site presents. ***All sub pages, including Campaigns page, support the main color scheme by using the same-colored buttons and typefaces in headings. ***Volunteer page will provide people with all the information they need to support charity organization. ***The Contact page features pleasant-to-look-at design with large map and feedback form.